One of the the key benefits of using Leadfeeder is its ability to show quickly just the information you need to react to immediately. Leadfeeder contains several tools to personalize how the leads are shown for you and your company. If you've wondered how to divide companies into different categories or, in fancy terms, attach meta-information to them (like #-signs in Twitter), then you should really try the in-built Tag-functionality. Let's go through a simple use-case with tags, so you can see how to benefit from them. STEP 1: Tag a company by pressing the Add tag button within the company details. STEP 2: A window opens (see image below), where you can create a new tag by writing the name of the tag on the field New tag and click then Create. You can also select a tag that is created before by clicking on the tag. Let's say the company in question is your biggest competitor. You might want to tag the company as 'competitor'. You can also set multiple tags per company. 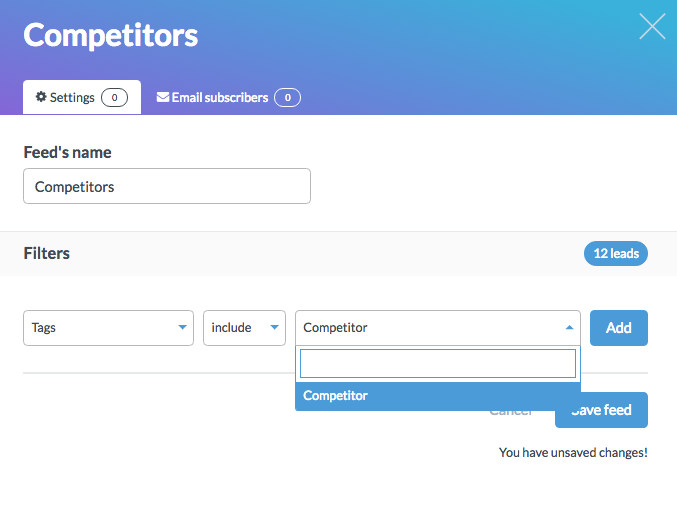 If you are interested in competitor tracking, you might want to check our competitor tracking pocket guide. You can also manage all your tags from the same window or add a new tag. STEP 3: Once added, the tag will show up in the lead information. You can always add or modify tags by pressing the tag button again. 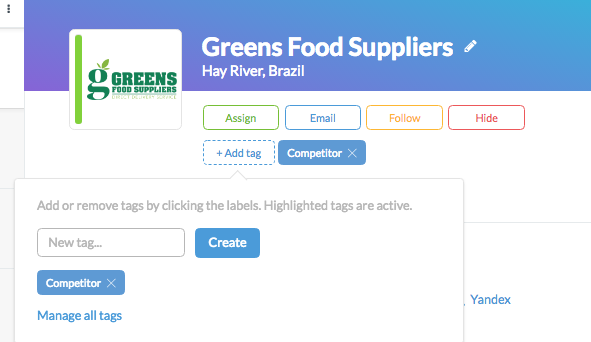 The more companies you tag, the easier it is to filter the tagged companies from your All leads feed. Let's have a look at how effectively you can filter tagged companies. 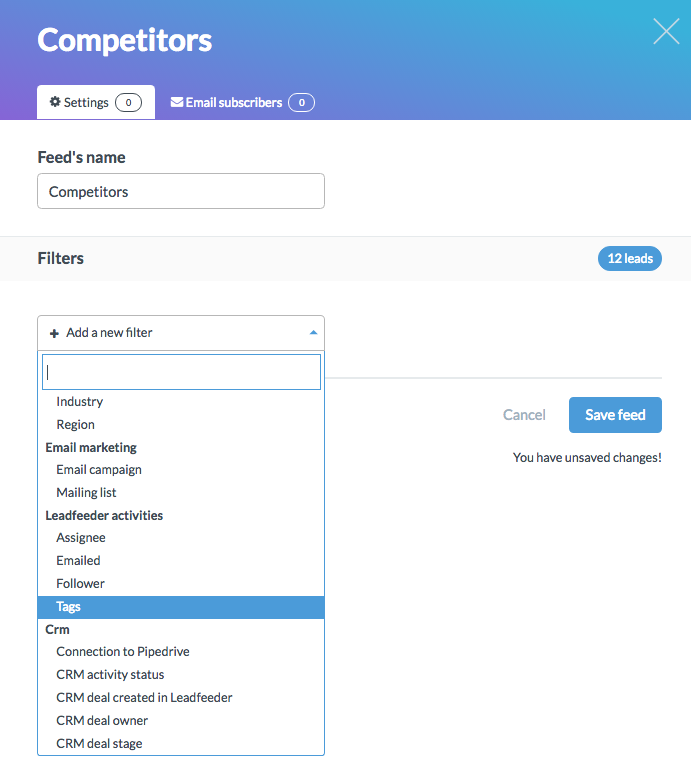 To filter tagged companies you should create a custom feed. If you've never created one, you might want to first have a look at the basics of creating a custom feed. STEP 1: Let's start by creating a custom feed by pressing the button Create new feed. STEP 2: Name the feed by writing that on the field under the title Feed's name. Select then Tags from the dropdown menu under the title Filters. STEP 3: Once the Tags filter is selected you are able to choose to include or exclude tags for the new custom feed. Once you've done that just press Save feed. You've now successfully created a custom feed. NOTE: Remember that you should seriously consider subscribing to email alerts so you get updated every time a tagged company comes back to your website. In the email alerts you can see what they have been doing on your website and how they got there. You can manage all tags by clicking Manage all tags. A new window will open where you can change the names, create new tags and choose a specific colour for the tag. What is a basic feed?